"[Temple] beat us in every facet of the game. They played better than us, every phase, from the opening kickoff." Memphis coach Justin Fuente was succinct in his postgame evaluation of Senior Day at the Liberty Bowl, an annual contest for which you'd like to think the home team will play its hardest, grittiest game of a season. As 15 U of M players played their last home game today, though, the Tigers collectively played their worst game of the year. Facing a Temple team at the bottom of the American Athletic Conference standings (1-10 overall record, 0-7 in American play), the Tigers gave up their most points and most yardage (534) of the season. Worse, though, was the Memphis offense. Facing an Owl defense ranked 113th in the country, the Tigers gained but 228 yards and were a woeful 2-of-12 on third down (and 1-of-3 on fourth), one possession after another ending abruptly, often with a Tom Hornsey punt. Despite running only 18 plays (compared with 52 for Temple) in the first half, the Tigers were very much in the game four minutes into the third quarter after Sam Craft caught a 10-yard touchdown pass from Paxton Lynch, one of three touchdowns Craft scored in the game. ("Sam was the only guy who played really well for us," said Fuente. "He showed toughness, grit. I was proud of Sam.") The touchdown closed the Temple lead to 17-14. But on the next play from scrimmage, Temple quarterback P.J. Walker (like Lynch a freshman) hit tight end Chris Coyer over the middle and Coyer sprinted untouched into the end zone for a 75-yard touchdown. Then just 1:11 of game time later, Sharif Finch broke through the Tiger line and blocked a Hornsey punt into the end zone, where it was recovered by Michael Felton to make the score 31-14. It was the 291st punt of Hornsey's record-breaking career and only the second the Ray Guy Award finalist has had blocked. The Tigers responded with a 62-yard touchdown drive, converting on fourth-and-four on a Lynch-to Craft connection, Craft then carrying the ball the final three yards for his third touchdown of the game. But Memphis wouldn't threaten to score in the fourth quarter, while the Owls added 10 points to pad their first AAC victory. "They had a crushing defeat last week [to Connecticut]," said Fuente, "and they showed us how to handle adversity. Their offensive line had their way with our defensive line, their running backs and receivers had their way with our secondary, their linebackers had their way with our running backs. They went to work and showed up here ready to play a football game. They're better than their record. Their quarterback is special." Walker completed 20 of 32 passes for 328 yards and four touchdowns (three of them to Robby Anderson). Jamie Gilmore carried the ball 16 times for 92 yards to lead the Owls. Lynch connected on 19 of 29 passes for 162 yards while senior tailback Brandon Hayes was limited to 38 rushing yards on 16 carries. When asked about his departing seniors, Fuente was again succinct: "I wish they, and everyone else on this squad, had played better today." The Tigers (3-8) finish their season next Saturday at Connecticut. After losing their first nine games, the Huskies have won their last two, including a victory over Rutgers today. Thanks to a second-half comeback against LSU in today's semifinals of the Old Spice Classic, the Tigers will get the chance Sunday to avenge the ugly loss they suffered on November 19th at Oklahoma State. Freshman forward Austin Nichols played a starring role after Shaq Goodwin took a seat with two fouls early in the game. The Briarcrest alum scored 19 points, including five during a critical 7-0 Memphis run that all but erased a 57-49 LSU lead. When Chris Crawford converted a breakaway layup (off a rebound at the other end) with 9:40 to play, Memphis had a lead for the first time since midway through the first half. Nichols later hit a jumper from just beyond the free-throw line — on a feed from Joe Jackson — to give the U of M a 70-66 lead and all the points they'd need against their foe from the SEC. Jackson hit all four free throws he took over the game's final minute to protect the margin. LSU's Anthony Hickey (20 points) and Johnny O'Bryant (14 points, 9 rebounds) helped keep the Bayou Bengals in position for the upset, but 24 turnovers and poor long-distant shooting (LSU hit five of 19 from beyond the three point line) did them in. 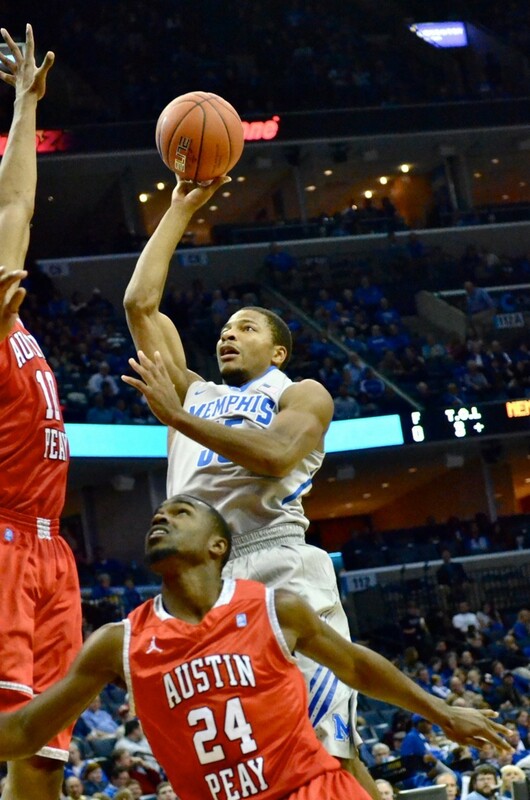 Memphis shot only 45.3 percent from the field and missed seven of their trey attempts. Crawford added 17 points for Memphis (now 4-1) while Jackson scored 16 and handed out seven assists. The U of M received only nine points off their bench. Michael Dixon made only one of seven field-goal attempts. Earlier today, the 5th-ranked Cowboys beat Butler to advance to Sunday's championship game (6:30 pm). In Oklahoma State's first meeting with Memphis, Marcus Smart poured in 39 points in a 21-point Cowboy win that really wasn't as close as the final score. Twelve days after a loss that shook the Bluff City, the Memphis Tigers — in the shadow of Disney World — will have the chance to rewrite the fairy tale. The Tigers had little trouble with Siena this evening in the quarterfinals of the Old Spice Classic in Orlando. With much of Tiger Nation transitioning from turkey to pie, Tiger sophomore Shaq Goodwin scored 10 points in the game's first 10 minutes and the U of M enjoyed a 15-3 run over a six-minute stretch of the first half to take control at HP Field House. Michael Dixon scored 13 points off the bench in the first half and was one of four Tigers in double figures with 16 for the game. Joe Jackson added a team-high 18, Goodwin 17 (with 10 rebounds), and freshman Austin Nichols 12. Memphis held the Saints to 33.8-percent shooting from the field and forced 20 turnovers, though Siena outrebounded the U of M, 47-41. The win improves the 21st-ranked Tigers to 3-1 for the seasion, while the Saints fall to 2-5. The Tigers will face LSU — a winner over St. Joseph, Thursday — in one of Friday's semifinal contests. Oklahoma State (the same Cowboys that drilled the Tigers on November 19th) will face Butler in the other semi. The championship game will be played on Sunday. Holding to format, I’ll present this class of Tigers in three categories. • I’m reluctant to ever use the expression “role player” during football season. Tell a young man getting the spit knocked out of him in mid-August training camp that he’ll be playing a “role” for his team . . . and take a step back. Football’s a brutal sport. The sacrifices we see on Saturday afternoon are a tiny slice of the toll taken over the course of the year (which includes spring camp). Defensive lineman Roderick Howard (a graduate of Kingsbury High School), offensive lineman Andrew Niblock, and wide receiver Jamere Valentine never topped the Tiger depth chart, but each devoted himself to coach Justin Fuente’s cause. Work done outside the spotlight can be hard to measure. In some respects, Senior Day is meant for players like this. • In basketball terms, these eight players have been in the Tiger “rotation” at one point or another, some for lengthy stretches. 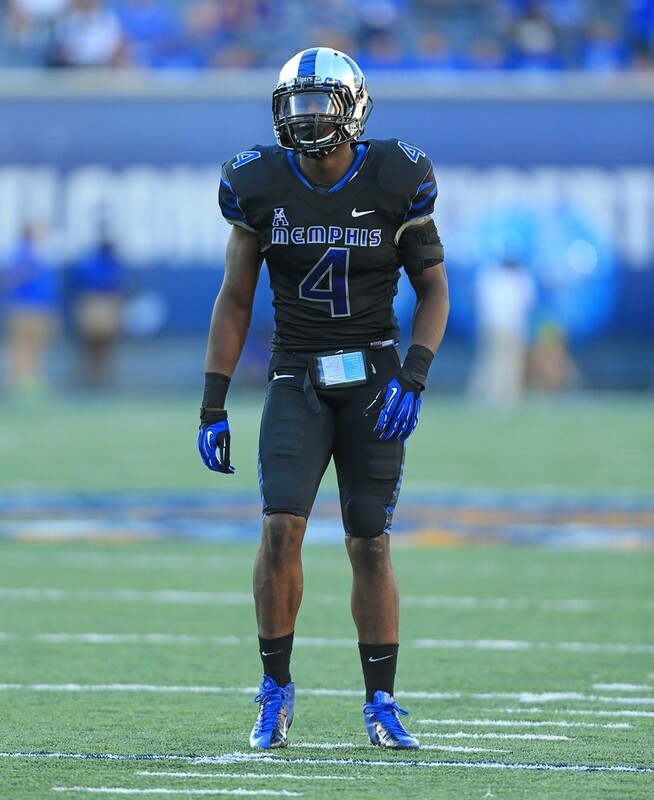 Anthony Brown has been a regular starter at linebacker since joining the Memphis program for the 2012 season. Defensive lineman Johnnie Farms entered the season as an all-conference candidate, only to serve a lengthy suspension for a violation of team rules. (Farms had 9.5 tackles-for-loss as a junior.) Antonio Foster has started at both guard and center over his two seasons as a Tiger and was a member of the team’s leadership council. Tailback Brandon Hayes (White Station High School) leads the U of M in rushing yards (789) and could become the first Tiger to gain 1,000 on the ground since Curtis Steele in 2009. Quarterback Jacob Karam made headlines this year for playing the piano at St. Jude, but he was precisely the leader the 2012 Tigers needed. He passed for 1,895 yards and 14 touchdowns last year, tossing only three interceptions in leading the Tigers to four wins, the program’s most in four years. Tight end Jesse Milleson caught one of the biggest passes of this season, a fourth-quarter touchdown connection with Paxton Lynch at Louisville that brought the Tigers within seven points of the heavily favored Cardinals. Jai Steib saw his workload drop when Hayes took over at running back, but he gained 427 yards as a junior and scored six touchdowns.Anthony Watson has been a regular starter at strong safety for the Tigers, strengthening a defensive backfield that just a couple of years ago was the weakest component of the team. • If you had to pick a “core four” from the 2013 senior class, it could well be this group, each of whom played four years as Tigers (two of them under former coach Larry Porter). They’ve endured the program hitting rock bottom (3-21 under Porter) and have been integral to the transition under Fuente. Free safety Lonnie Ballentine (Southwind High School) started eight games as a sophomore and has been a regular starter the last two seasons under Fuente. He received honorable-mention all-conference recognition from Conference USA after the 2012 season and has 97 solo tackles for his career. 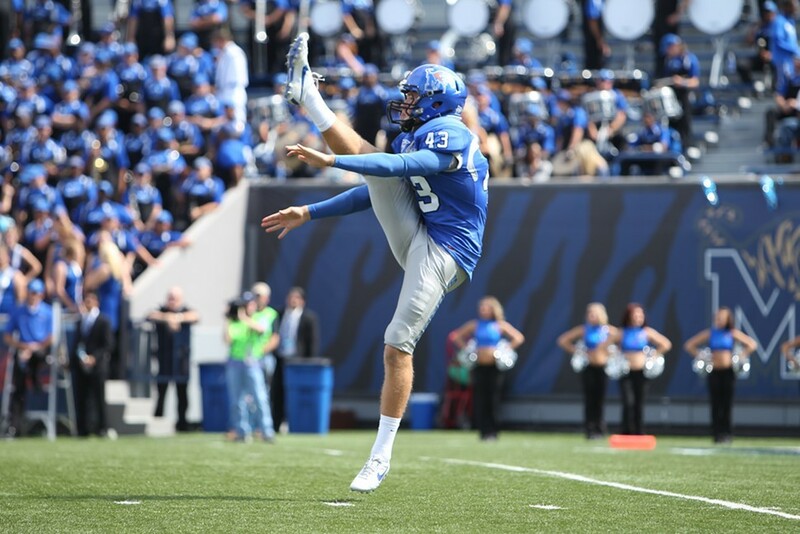 Simply put, Tom Hornsey is the greatest punter the Memphis program has seen. The Aussie deserves hazard pay for the sheer number of kicks he’s been assigned (95 in the 2011 season alone). He has surpassed 12,000 yards for his career (no other Tiger reached 10,000), dropped 95 punts inside the opponent’s 20-yard line, and has had but one of his 286 punts blocked. If there’s justice, he’ll receive the Ray Guy Award at season’s end. Linebacker Corey Jones (Mitchell High School) started four games as a freshman in 2010 and has seen action in 44 games as a Tiger. Offensive lineman Chris Schuetz has started at least seven games each of the last three seasons, playing center as a sophomore before moving to guard as a junior and back to center this season. You build a program on the backs of your seniors. Hats off to the weight of growth these 15 Tigers carried. Tonight's game at FedExForum offered the Tigers a chance to shake the stink off, four days after a drubbing at Oklahoma State changed the citywide view of where the 2013-14 team is heading. With the words "course correction" in the air, Memphis raced out to a 21-8 lead over the game's first nine minutes and cruised to its second win of the season and final game before next weekend's Old Spice Classic in Orlando. 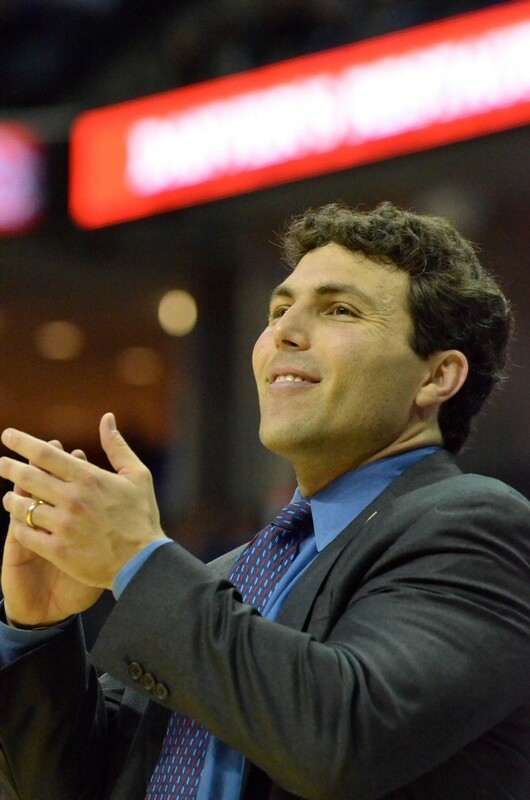 "I deserve to be criticized after our performance Tuesday night," said Memphis coach Josh Pastner after the game. "I knew [our team] would hear a lot of things this week. And I want to take as much of the heat as possible. We're grateful for the coverage we get; that's part of the territory." "We didn't play Oklahoma State tonight," Pastner added. "I recognize that. This was more about us, and course correction." Freshman Austin Nichols led the Tigers with 20 points in 24 minutes, hitting nine of 15 field goal attempts. He was one of four native Memphians to reach double figures, with Joe Jackson adding 18 (hitting 14 of 15 from the free-throw line), Chris Crawford 11, and freshman Nick King 12 (despite missing nine of 13 free throws). Michael Dixon (alas, a native of Kansas City) added 16 points and hit all three of his three-point attempts despite suffering a nasty scratch to his left eye early in the game. The Tigers got to the foul line 50 times (Nicholls committed 37 fouls), but made only 31. They shared the ball well, though, picking up 22 assists on their 31 made field goals. With 16 points, Jeremy Smith was the only Colonel to reach double digits. Nicholls has lost its first four games of the season, while the Tigers are now 2-1. When asked if focus was difficult against an inferior opponent, Crawford insisted the Tigers' veterans made sure it was not. "When you're older, you know how important it is for you to stay focused, locked in," he said. "You can't let up; gotta finish. If we execute and do our job, we'll win." Memphis outrebounded Nicholls, 48-34, Shaq Goodwin leading the way with eight while King and Geron Johnson added six each. Johnson took only two shots but led the Tigers with five assists. "We've got to continue to get better," said Dixon. "We've got to work on our craft individually, and as a team, then keep moving forward. I think we'll be fine. [Tonight] there was tremendous emphasis on getting the ball inside. Austin Nichols, Dominic Woodson (eight points in seven minutes), and Nick King all did a great a job. That was the biggest thing, getting our big guys involved." And forget the blowout win, according to Dixon: "That's senior leadership. We've got to play like the score is always zero-zero. And at halftime, they erase the score. It's a new ballgame." The Tigers will next take the floor Thursday night in Orlando when they face Siena in their opening game of the Old Spice Classic. The Tigers traveled to Papa John's Cardinal Stadium in Louisville today as 23-point underdogs. They left with perhaps the most promising performance in two years under coach Justin Fuente. Facing the second-ranked defense in the country, Memphis scored two fourth-quarter touchdowns to pull with seven points and had a chance, with three minutes left in the game, to take possession for a chance to tie the 21st-ranked Cardinals. Tiger sophomore Reggis Ball, though, was penalized for roughing the Louisville punter near midfield, giving the ball back to the Cardinals. By the time the Tigers regained possession (having exhausted their timeouts), there was less than a minute to play and more than 85 yards of field to travel. The clock expired after a Paxton Lynch pass fell incomplete near midfield. Louisville scored the game's first points on a 47-yard fumble return by Preston Brown just over ten minutes into the game. Despite the ball traveling 10 yards forward upon leaving Lynch's hand — and despite an official review of the replay — the apparent pass attempt was confirmed a fumble and the Cardinals had a 7-0 lead. The U of M got on the board with 6:54 to play before halftime when Jake Elliott converted an 18-yard field goal. The Tigers were held on three attempts inside the Cardinal five-yard line after Lynch completed a 47-yard pass to Keiwone Malone. On the Cardinals' next possession, though. All-America candidate Teddy Bridgewater completed a 39-yard touchdown pass-and-run to DeVante Parker. (Bridgewater played gingerly for much of the game, fighting an apparent back injury.) Cardinal kicker John Wallace added a 39-yard field goal to make the score 17-3 at the half. The Tigers attempted an onside kick to open the second half, only to have Elliott touch the ball before it traveled the required ten yards. Bridgewater proceeded to lead a 16-play drive that chewed up more than six minutes, culminating with a four-yard touchdown run by Dominique Brown to extend the home team's lead to 24-3. Behind a ground game led by senior Brandon Hayes (86 yards on 22 carries), the Tiger offense rose near the end of the third quarter, and Lynch stretched into the end zone for a four-yard touchdown on the first play of the final period. The freshman quarterback later scampered for 15 yards on fourth-and-11 to extend a Tiger drive that resulted in a Lynch-to-Jesse Milleson touchdown pass of six yards. The score came with 6:07 to play and would be the final points of the afternoon. Bridgewater completed 26 of 36 passes for 220 yards to help Louisville improve to 10-1 on the season. Lynch was 11 for 23 for 144 yards as the Tigers fell to 3-7. Overall, Louisville outgained Memphis, 342 yards to 279, though the Tigers won the ground battle, 135-122. Memphis entered the game as the country's most penalized team and only committed three for the game (including that errant onside kick). Alas, the roughing-the-punter infraction killed the Tigers' late-game momentum and too much of the remaining game time for Memphis to pull off the upset. The Tigers return home for Senior Day next Saturday when Temple visits the Liberty Bowl for the first time. As a longtime gridiron rivalry with the Cardinals comes to a close, a new one with the Owls is set to begin. With just over eight minutes played tonight at Gallagher-Iba Arena in Stillwater, the 11th-ranked Tigers were tied with the 7th-ranked Oklahoma State Cowboys. That's the last indication the two teams belong on the same floor. Preseason All-America Marcus Smart outscored Memphis 24-20 over the first 12 minutes on his way to a career-high 39 points in the Cowboys' fourth blowout victory of the season. It was only the second game under coach Josh Pastner that the Tigers have allowed 100 points, the first being a 104-84 loss at Tennessee on January 5, 2011. Freshman forward Nick King led the Tigers with 23 points and 8 rebounds while Shaq Goodwin added 13 and 7. The Tigers' vaunted quartet of senior guards — Joe Jackson, Chris Crawford, Geron Johnson, and Michael Dixon — combined to score 21 points. OSU won by 21 points despite taking nine fewer shots. Memphis missed 11 of 13 from three-point range and shot 40 percent (28 for 70) for the game. The loss drops the Tigers (1-1) to 0-7 against Top-10 teams in five seasons under Pastner. And it rings an all-too-familiar bell for Memphis fans long accustomed to the Tigers beating up on lesser competition (Austin Peay), falling short against power teams, then licking their wounds against more weak sisters (Nicholls State this Saturday?). The Tigers' next real test will come with three games at the Old Spice Classic in Orlando on Thanksgiving weekend. Among the teams in the field near Disney World: Oklahoma State. Memphis football fans are learning to thank their lucky goal posts. Last week, two field-goal attempts by UT-Martin deflected off the left upright in the Tigers' first victory since September. Tonight at South Florida, a 56-yard attempt by Tiger freshman Jake Elliott with 12 seconds to play in the first half bounced off and over the crossbar to give Memphis a 6-0 lead. Elliott's monster kick broke Stephen Gostkowski's eight-year-old program record by three yards. With Brandon Hayes chewing up the last 30-plus yards on the ground, the Tigers drove 59 yards midway through the fourth quarter, culminating in Hayes's seventh touchdown of the season. The Tigers' only offensive touchdown gave Memphis a 13-3 lead with less than five minutes to play. Elliott added a third field goal (from 34 yards) after a Dion Witty interception. With less than two minutes to play, Tiger cornerback Bobby McCain intercepted a Mike White pass — his second pick of the game and fifth of the season — and sprinted 36 yards for a touchdown that gave the Tigers 17 points in the game's final five minutes. McCain intercepted a third pass on a desperation heave to end the game. Hayes ran for 78 yards on 20 carries, while quarterback Paxton Lynch rushed for 51 on just six carries. Lynch completed only six of 13 passes for 59 yards. The Tigers once again struggled with penalties, committing nine for 81 yards (almost precisely their nation-leading average for yardage penalized). The win gives Memphis (now 3-6) its first road win of the season and first in American Athletic Conference play. The Tigers travel to Louisville next Saturday to face the 20th-ranked Cardinals. The game will be the only AAC meeting between old rivals, as Louisville moves to the Atlantic Coast Conference in 2014. Senior guard Chris Crawford pushed the basketball across midcourt, four gray-clad teammates sprinting ahead in transition after an Austin Peay turnover. Crawford delivered the ball to fellow senior Geron Johnson in the right corner. Johnson could have let fly a three-point attempt but instead swung the ball to yet another senior guard, Joe Jackson, on the wing. Jackson could have taken a long-distance shot, but chose to drive into the lane, where his shot bounced off the heel of the rim. 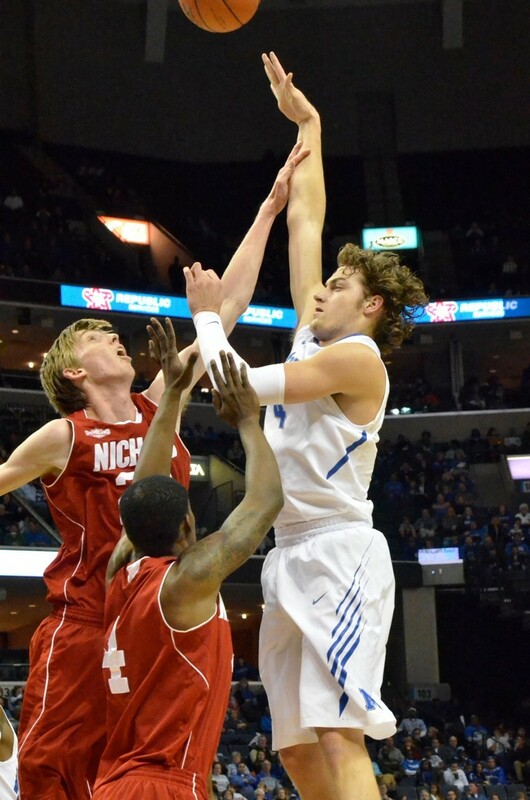 But there to flush the rebound was freshman forward Austin Nichols. His dunk gave the Tigers an 81-50 lead and stirred a small (for Tiger basketball) crowd of 15,785. Each of those fans hopes the play — and the Tigers' season-opener in general — is an indication of the abundance of options Memphis coach Josh Pastner has to call upon this season. The options will be needed, starting next Tuesday when the 13th-ranked Tigers travel to Stillwater, Oklahoma, to face the 8th-ranked Oklahoma State Cowboys. • Jackson: 16 points, and 7 assists in 29 minutes. • Johnson: 11 points, 10 rebounds, and 4 assists in 26 minutes. • Crawford: 11 points, 8 rebounds, 4 assists, and 4 steals in 23 minutes. 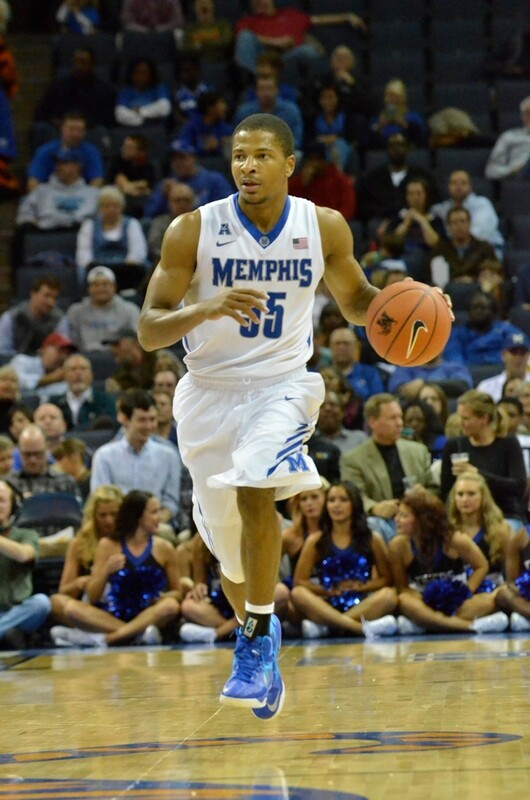 • And making his Memphis debut, Michael Dixon: 15 points, 4 rebounds, and 4 steals in 24 minutes. The guard-heavy lineup led a press that wore the visiting Governors down (22 turnovers) and created the kind of quick-strike opportunity the resulted in easy baskets like the Nichols follow-up dunk. Memphis led by 22 (51-29) at halftime and coasted over the game's final 20 minutes. Johnson was ho-hum about his first career double-double, saying "It's good. I'm blessed. Hopefully I'll get more. I'm glad I got 10 rebounds, but it's about time." He was more emphatic about his collection of teammates, and that goes beyond the senior "fab four." "We're a unit," said Johnson. "It just so happens we have four senior guards. Hopefully we'll get better. Seniors and freshmen, we all have a lot to learn." Reluctant to sing their own praises, Johnson and Dixon were eager to applaud his teammate's impact tonight in their first game together. "Michael brings leadership and intensity," said Johnson. "He's a versatile guard who knows the game. Did you see him out there? He was getting to the basket like [Derrick] Rose, and he's 5'11"." And when asked about Johnson, Dixon was just as effusive. "He's all over the floor," said the Missouri transfer. "He brings so much energy to our team, deflecting passes, getting rebounds, cutting guys off. He's one of the best I've ever seen at being on the defensive end, then getting to full speed on offense." Sophomore Shaq Goodwin (10 points, but only two rebounds and five turnovers) gave the Tigers six players in double-figures in the scoring column. Overall Memphis outrebounded the Governors 50-27. There won't be that kind of edge next Tuesday. But for tonight, a fast-paced win to open a long season with great expectations. "It was as fun as it looked," said Johnson. He smiled when he said it. Briefly. • The Tiger penalties have to stop. Since the Oakland Raiders franchise was born (in 1960), no pro team has led its league (first the AFL, since 1970 the NFL) in penalties more than the “Silver-and-Black” made famous by outlaw owner Al Davis. While no other team has led the NFL as many as 10 times over the last 53 years, the Raiders have paced pro football in penalties no fewer than 15 times. Somehow, this is a lauded part of the franchise’s image for ferocity. If you wear Oakland Raiders colors, breaking the law is cool, and that translates to committing penalties on the field. 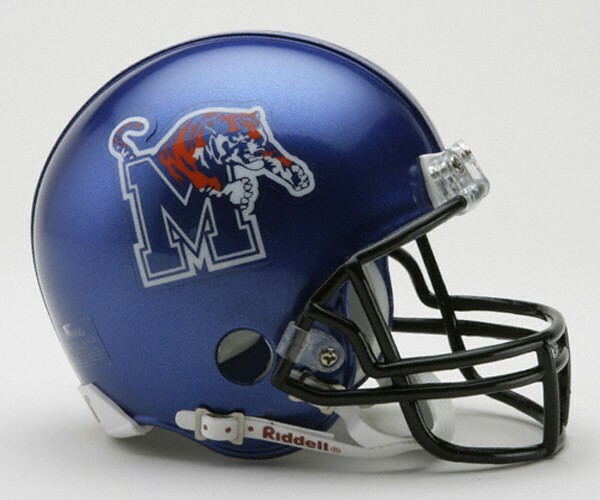 The Memphis Tigers are not the Oakland Raiders. They escaped last Saturday’s game against FCS foe UT-Martin with the help of two field-goal attempts off an upright and despite twelve penalties that cost the U of M 123 yards and a player (almost two). After eight games, the 2-6 Tigers “lead” (trail, really) all of FBS with more than 80 yards per game in penalties. And these infractions are costing the team wins. In the two-point loss at Middle Tennessee in September, Memphis surrendered 145 yards in penalties (called by the same crew that worked the UT-Martin game). In the 10-point loss at Houston, the Tigers were penalized for 86 yards (four lost fumbles didn’t help). And in the five-point loss to SMU last month, the Tigers were penalized for 110 yards. I’ll venture to say one of those games goes the Tigers’ way if the penalties had been cut in half. It’s sloppy. And it’s an ugly reflection on a team being built on discipline by a still-new coaching regime. The penalties have to stop. Make the opponent beat you. • With every passing week, my favorite individual story of the season is that of Brandon Hayes. The senior tailback from White Station High School leads Memphis with 625 rushing yards and six touchdowns, two years after running for 556 yards — for the season — with Scottsdale Community College. Remember, Hayes walked on at Memphis as a freshman in 2010, only to lose that season to a broken foot. He returned to Memphis when Justin Fuente was hired before the 2012 season, and played without a scholarship until late October of his junior season. He led the Tigers with 576 rushing yards last year, surpassing 100 in each of the Tigers’ last two wins of the campaign. Hayes has topped 100 yards in each of the Tigers’ two wins this season, meaning you can count on seeing a few carries by number-38 this Saturday at USF. Said Fuente at Monday’s press luncheon: “Brandon’s going to be our guy.” Hayes has a reasonable shot at a 1,000-yard season, which would place him in the top-15 in Tiger history. Better yet, he’s a nominee for the Burlsworth Trophy, given annually to the most outstanding college football player who began is career as a walk-on. • The Tigers have three realistic chances at winning their first American Athletic Conference game, the first this Saturday against USF in Tampa. The programs last met in the 2008 St. Petersburg Bowl, the Tigers’ last taste of postseason play. (The Bulls won what amounted to a home game, 41-14.) USF is dead last in the American in total offense (256.0 yards per game) and scoring (15.4 points). They’ve scored but 12 touchdowns in their eight games (third-lowest total in the country). But among common opponents, USF beat a Cincinnati team that handled the Tigers. Their other win came at UConn (13-10) five weeks ago. It’s not the Bulls’ offense that concerns Fuente, not based on his remarks Monday: “It’s going to be a rough game, the way they play defensively and the way we’re capable of playing defensively.” Sounds like one of those 16-13, who-plays-less-poorly kind of games. Keep the penalties down, boys. For the Memphis Tigers, It's Time for Tip-Off! The “secret scrimmages” and exhibition games are over. In modern vernacular, the Memphis Tigers tip off the 2013-14 basketball season this Thursday night, for real. • The Tigers’ four senior guards — Joe Jackson, Chris Crawford, Geron Johnson, and Michael Dixon — will form a rotation-within-the-rotation unlike any other in college basketball. Each has enjoyed a 30-win season, and each faces a final year that will brand their careers as college athletes. How these four similar-but-different playmakers establish their roles — within the larger rotation and among themselves — will largely determine the ceiling for this year’s team. It’s hard to envision a moment this season — in a competitive game — when the Tigers do not have a senior guard on the floor. In the exhibition win over CBU last Friday, Jackson and Dixon started, with Crawford (Conference USA’s 2013 Sixth Man of the Year) and Johnson coming off the bench. They each played between 15 minutes (Crawford) and 20 (Dixon), figures sure to leap when the likes of Oklahoma State or Florida are the opponent. Crawford took only three shots (missing all three) and Jackson was only two for six from the floor. But Dixon hit an early three-pointer and led the team with 18 points (hitting seven of ten shots from the field). And Johnson — again the best athlete the Tigers will suit up — hit four of eight (including a trey) and dished out four assists. It’s a potentially lethal “fab four” at Josh Pastner’s disposal. Collectively, they’ll be the faces we remember years from now in reflecting on the 2013-14 season. 1)	Austin Nichols — Dexterity, grace, and length. Midway through the first half, Nichols received a pass just outside the key, maybe seven feet from the rim. Without taking a dribble, the 6’8” forward used one stride to get to the rim and lay the ball in off the glass. It was a simple, elegant basketball play by a big man . . . in his very first college game. Memphis has grown accustomed to brute force in the low post, from Chris Massie to Joey Dorsey to Will Coleman (and some degree, Tarik Black). Nichols brings an offensive repertoire that diversifies the Tiger attack. 2)	Nick King — Having watched ESPN’s new documentary Bernie and Ernie last week, I had another King — Hall of Famer Bernard — on my mind as the pride of East High School managed a double-double (12 points and 10 rebounds) in 22 minutes against CBU. King hit five of seven field-goal attempts (including a pair after offensive rebounds) and picked up three steals, playing the kind of active role Tiger fans remember from Will Barton two years ago. (Or Tennessee fans of a certain generation might remember from a certain Bernie.) King will have to guard forwards much of this season and, especially once conference play begins, will be challenged to find some of the shots that seemed to come easily last Friday night. But his minutes will add up, and Tiger fans are going to like him. 3)	Dominic Woodson — The Tigers lost three of their top four rebounders from last season (Black, Adonis Thomas, and D.J. Stephens). Senior forward David Pellom will be sidelined five weeks after having knee surgery last week. So who will absorb the rebounding responsibility? The 6’10” Woodson only pulled down two boards in 18 minutes against CBU, but if he shows the touch on offense he displayed against the Buccaneers — seven of seven from the field — this giant (he’s listed at 310 pounds) will do his share of stomping on the hardwood for Pastner. You can’t help but wonder if Woodson benefited more than any other Tiger from the smaller opposition. Let’s see what kind of impact he makes on November 19th at Oklahoma State. 4)	Kuran Iverson — Raw. An overused description for a basketball player making a transition in level, but it’s the word I had in the back of my mind all 16 minutes Iverson played last Friday night. Pastner just about split his suit with excitement when Iverson dunked an offensive rebound in the second half. At 6’10”, Iverson has the chance to fill much of that rebounding and defensive void left by Stephens. But he has an erratic offensive game (he missed seven of ten field-goal attempts) and will give weight to many of the players who guard him this season (he’s listed at 209). What a luxury, though, if a top-30 recruit is merely the fourth-best freshman on the Memphis roster.